I was elated to read overnight that many former Engadget staffers had joined forces to continue their craft in a new home - teaming up with SB Nation, currently home to more than 300 sports blogs spanning professional and amateur teams around the world. The excitement came not because we need yet another technology blog network (as there are a few already), but because of their choice - partnering with a forward-looking company that has harnessed the fervor of sports fandom, giving people a voice, becoming the truest example of people-powered blogging in the world, driving addicting communities and real-world interaction around shared interests. If the same process is followed, but applied to the world of gadgetry, the results could be tremendous. For those who don't know the history, the first blog to pioneer SB Nation was Athletics Nation, a baseball-centric blog covering the Oakland Athletics. The blog came about as Tyler Bleszinski, longtime A's fan and sufferer (as am I) couldn't find a place online to vent about the team in good times and bad. With powerhouse ESPN suffering from East Coast bias, and local papers having no way to interact with fellow fans, he was pushed by Daily Kos founder Markos Moulitsas to start a blog - which later spread to a family of similar blogs, beginning with baseball, and later branching out to all manner of sports, from mixed martial arts to cycling, figure skating and golf. If there's a sport that has fans who want to talk about it, SB Nation has been there. Belatedly (for me anyway), I found Athletics Nation in early 2005, and my first thought was, "where have you been all my life?". The site promised real-time gameday threads to chronicle the day's contest, opinion posts from front page writers and regular contributors alike. Later, "Blez", as was his online moniker, gained access to exclusive interviews with A's general manager Billy Beane, owner Lew Wolff, and other players. Athletics Nation (or AN) was on the map, and started to be noted for its influence among die-hard fans. Bay Area sports journalists including Susan Slusser and Mychal Urban also made appearances, talking with ANers directly. 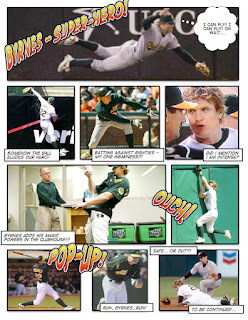 In July of 2005, fooling around with the Mac comics application Comic Life, I made a comic featuring then-A's player, Eric Byrnes, who would be amazing one play, boneheaded the next. 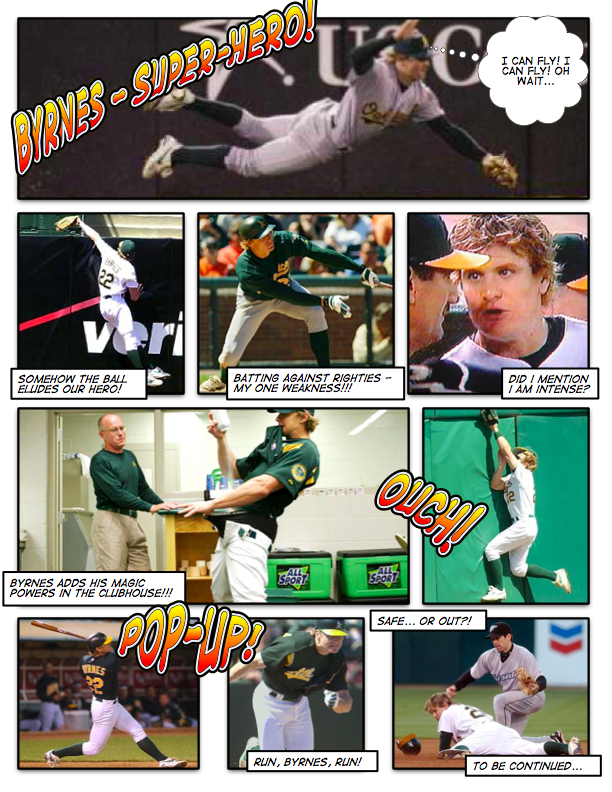 (See comic) This silliness led to another comic and another, to the tune of three in five days, before the A's short-circuited my plans by trading Byrnes to the Rockies. With this void, Blez asked me to make an A's comic a regular feature, and the ANtics were born - posted each Sunday through the season and occasionally in the off-season. I kept this up for a few years, before tech and kids took over the rest of my life. Meanwhile, due to the ANtics, I gained front-page publishing access to Athletics Nation, and was eventually put in the mix for gameday threads and other weekly posts, along with other unpaid writers who filled out the week. Opinion posts (like this one from 2008) could get 10 comments from the community or hundreds. Game threads always got hundreds, for the community would writhe in pain for every popout and celebrate every run together, regardless of geography. Where SB Nation differs from all the other major tech sites is that fans have a voice - beyond the comment streams which often become full of vitriol. SB Nation blogs feature fan posts on any related topic, and the community generally does a good job voting up the great posts and highlighting the poorly thought out ones. SB Nation prides itself on linking to third party content and not regurgitating other's articles, even if the blog's main focus is not on break news and reporting, but instead being part of the experience. SB Nation blogs typically have a pair or more moderators who can manage user accounts, delete comments, promote fan posts to the front page, or send users email to say they are on probation. Users can recommend great comments and posts or flag them for review by a moderator. And over time, since every participant requires a user name and one's history is attached to the user name, you see a real community develop, with people who have history and a shared experience. Blez and the Athletics Nation team celebrated the community through yearly "AN Days" at the Coliseum to take in games, and helped collect money from the community for appropriate charitable causes. AN even featured an online store for shirts and other gear that bear the site's name. Since the site's start with a single blog, run by a diehard Eric Chavez fan, the burgeoning network now features regional hubs for local teams, a dedicated baseball hub (which I highlighted Friday) and a pattern of success which requires commitment to hard work, fun and community interaction. If the track record of SB Nation is to be repeated in the world of technology, you can expect writers that are accessible, fans who have a voice, excitement about gadgets and software, and a standard look and feel that has you knowing you've reached an SB Nation site upon first visit. If you're a longtime louisgray.com reader, this shouldn't surprise you. In 2006 I highlighted the growing network. In 2007, I highlighted the home page revamp. In October of 2008, I highlighted their mobile site work and subsequent funding round. I have been a longtime believer in the model of fan-centric publishing and it's clear that it has worked. If the SB Nation Tech team is half as successful as the sports side has been, there's no question the network will be a must-read, go-to, community.